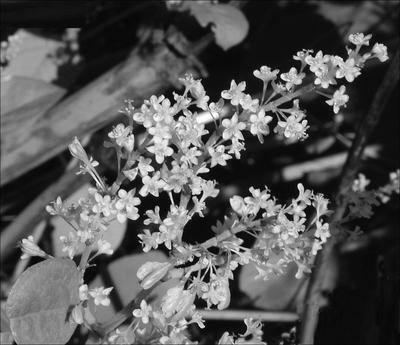 Japanese Knotweed (Polygonum cuspidatum) is one of the most troublesome plants at Todmorden Mills, but when it was introduced to Canada in the late 1880s it became a popular garden ornamental. It is not difficult to see why --the luxuriant foliage, mid-summer spikes of frothy white flowers, and the striking bamboo-like stalks which remain standing long into winter. Unfortunately, Knotweed, like many other imported plants, escaped gardens and became naturalized in wild areas. It is now widespread in the Don Valley, and is well established at Todmorden where we have found at least five big patches. Scientists are still not sure why some exotic species become "invasive" (many introduced plants never escape cultivation, let alone become threats to native vegetation). Knotweed shares many of the characteristics of other pernicious invaders: it reproduces both clonally (by rhizomes) and by seed (but predominately the former); it has few natural enemies or biological controls; and it can grow in a wide range of conditions, from deep shade to full sun. In the absence of natural checks and balances, Knotweed spreads rapidly, crowding out native plants. Toronto author and gardening expert Lorraine Johnson gives a funny account of her battle with Knotweed in her book The Gardener's Manifesto (pages 60-62). She tried pulling, cutting, burning, and even praying to no avail, and it was only after her neighbour excavated the huge root mass associated with the clump, and she maintained a strict cutting regime for sprouts, that she was able to declare her yard knotweed-free. Key to Knotweed's success, and the reason why it is most difficult to control, is the enlarged root tuber or rhizome. The rhizome functions as a food storage organ for the plant. Once flowering is completed in late summer, energy is diverted back into the rhizome before the die-back of stems. In spring, the rhizome fuels the initial growth of new shoots. Knotweed clumps expand as the spreading rhizomes sprout new shoots. In addition, new plants will sprout from even tiny pieces of the rhizome--so digging up plants can actually increase the spread of the clump as fragments are scattered in the soil. At Todmorden, the weed stewardship team has adopted a mixed strategy to eradicate Knotweed clumps. Plants were initially dug out and carefully disposed of: whole plants were stacked on bare ground to dry out. Subsequently, re-sprouted plants were cut off near ground level repeatedly. As it can take years to eradicate a large patch of Knotweed using cutting techniques alone, this approach is combined with the topical application of a translocatable herbicide such as glyphosate, to achieve results more quickly. For those keen to try their hand at Knotweed control this year, the weed team will be re-convening in June for the first Knotweed cutting event. This article (and accompanying photo) is by Mike Dennison. Since our last newsletter, quite a bit has happened at the Preserve. We are pleased to announce the publication of Todmorden Mills Wildflower Preserve: Environmental Baseline Study by James Kamstra. Copies of the 46-page report can be obtained from TMWP for $15. An enthusiastic group of 24 staff, family and friends of American Express Headquarters planted wildflowers and ferns on October 4, 2003. TMWP members followed up with two planting events later in October. In all, nearly 800 plants were planted in the fall. Board member Bogna Jaworski spearheaded a weed stewardship team in 2003. The main targets of volunteer efforts were Japanese Knotweed (see feature article this issue) and Himalayan Balsam. The Knotweed patch near the trailhead was cut twice by volunteers (in mid-June and again in September). Himalayan Balsam was cut, bagged and removed during its flowering period in September. Our first public meeting in several years attracted nearly 30 members and friends on November 21, 2003. Attendees were treated to three presentations: Chair Paula Davies reviewed the year 2003, James Kamstra gave an informative talk about the vegetation communities at Todmorden, and summarized the major findings from his report, and our guest speaker, Gregor Beck from the Federation of Ontario Naturalists, gave an entertaining lecture on watershed ecology and policy. In May 2000 a storm dumped nearly 10 cm of rain on the region in less than 12 hours and the Don River flooded badly and backed up into the Preserve (this same storm precipitated the Walkerton E. coli tragedy). The long boardwalk south of the pond, which had been installed just a few months prior, was floated about a metre off its alignment. In October, 2003 we were finally able to obtain funding for a crew from the Toronto and Region Conservation Authority to fix the problem. Staff cleverly removed a section from the high end and inserted it into the other end so that the boardwalk was level with the trail again. From top: American Express staff at a fall planting event; TRCA staff repairing the boardwalk; Mike Dennison giving a guided walk. There's always something different to see, hear or smell on the trail in the Preserve. That's why we remind visitors to come back again and walk the trail at different times of the year, and even at different times of the day. By late summer, most of the flowering is occurring out in the meadows. This year, the Cup Plant patch seemed noticeably enlarged from the previous year. The tall, square-stemmed stalks remain prominent through winter. Additionally, clumps of Grey-headed Coneflower and Wild Bergamot seem to have established nicely. A young Great Blue Heron fed nonchalantly in the pond and the oxbow over a period of about two weeks in late August. Hopefully it did not eat all the fat Green Frog tadpoles. A Muskrat took up residency for much of the summer in the oxbow, with occasional forays into the pond. It was observed using the culvert at the south end of the oxbow as a feeding shelter during the day. There were tell-tale cut stems of cattails with the tasty rhizomes eaten off and discarded at the entrance to the culvert. This summary was prepared by Mike Dennison, based on reports from TMWP members and friends. Members and friends are welcome to attend TMWP events. For planting events, we recommend that you wear sturdy footwear. We meet briefly in the parking lot before each event. Saturday, April 17, 10:00 - 12:00 p.m. Annual Spring Kick-off and garbage clean-up. With Friends of the Don East (FODE). Sunday, May 2, 2:00 p.m. Spring wildflower walk. All welcome. Saturday, May 15, 10:00 - 12:00 p.m. Spring planting event. Members and friends welcome. Saturday and Sunday, May 29 and 30, 10:00 - 4:00 pm. Guided nature walks of the Preserve, in conjunction with City of Toronto Open Doors. Once again, we have members, volunteers and supporters to thank for their wonderful help. Our generous members who supported us with recent donations: Donald Simpson, Deanne and Vahram Sedef, and Glenn Gillespie. Alina Shilo and American Express staff for their continued support of our fall plantings. Garth Armour, Keri McMahon and staff of the City of Toronto Parks and Recreation Department for donation of plant stock for the AMEX planting. Stephen Smith, UFORA Inc. for help with coordinating our AMEX planting. Mary Marcon, teacher, and students of St. Patrick's Catholic High School; and Ellen Murray, teacher, and students of Rosedale Heights School of the Arts, for help with plantings. Special mention of Michael Almeida, a student at St. Patrick's, for his enthusiastic help with trail maintenance and weed control. Dave Rogalsky, Toronto and Region Conservation Authority, and his crew for fixing the boardwalk this fall. City of Toronto Councillor Ootes for facilitating the funding of the repair work.